Description: The flowers are non-solitary and have 5 narrowly fan-shaped petals, styles shorter than the stamens, 5 arrowhead-shaped anthers, and 5 spherical stigmas. The flower buds are nodding or drooping. The leaves are green and linear to narrowly lanceolate in shape. 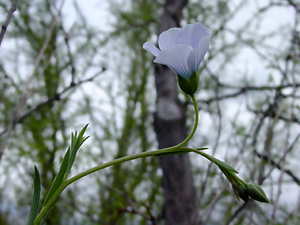 The stems are green, slender, and hairless. 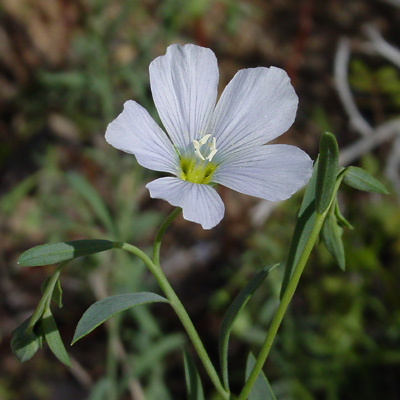 The similar Lewis Flax (Linum lewisii) grows at higher elevations and has broader, darker blue or white petals and longer styles.